William Shakespeare's The Tempest is thought to be based on a letter to King James and one of the last plays he wrote. Performed in the natural amphitheater at Bason Botanic Gardens, this production follows on from the acclaimed season of Macbeth in 2016. Directed by Karen Craig and produced by Kathy Cunningham, the cast and crew are a delightful variety of seasoned amateurs to first time performers. Bason Botanic Gardens closes at dusk which means that enjoying this performance is the only time that you are allowed on site at night. With music, dancing, magic and more, this production is bound to thrill, especially when Whanganui Mayor Hamish McDoull makes his appearance! 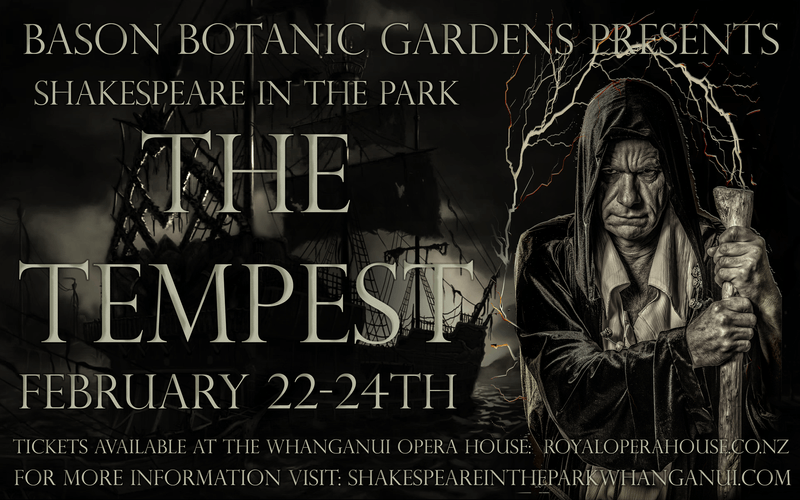 Order a picnic hamper when buying tickets and enjoy Shakespeare in the Park in Whanganui this summer.